Dental implants are indicated whenever at least one tooth is missing. If the missing space(s) is not filled, the teeth surrounding the space often drift, the opposing teeth in the other arch will erupt further into the oral cavity (hypereruption) which can change your bite, bone erosion can occur in the area, and even changes in speech might occur. The popularity of implants has increased steadily over the years. 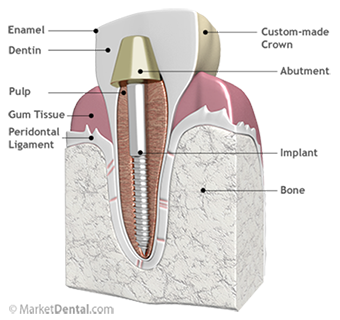 Dental implants are designed to replace the root of a missing tooth and can be used to support crowns, bridges, or dentures. Implant supported dentures have gained a major popularity in the recent years. New materials and techniques have made the retention of the implant supported dentures to a greater extent than conventional dentures. Implant screw – This part of the implant is made of titanium and is surgically placed in the bone. Titanium is accepted by the body extremely well and fuses with the bone (called osseointegration) during the healing process. Abutment – This is a metal collar that attaches to the top of the implant screw and is the base for a crown, bridge, or denture. Crown - The crown is the manufactured tooth that fits on top of the abutment. Bridges and dentures can also be secured to the abutment. The placement of the crown, bridge, or denture is the final step of the implant process. A Toronto, ON Dentist winner of the Patients' Choice Awards. City Oasis Dental has been recognized as one of the top Toronto Dentistry practices. Copyright © 2019 General & Cosmetic Dental Care cityoasis.dentalAll Rights Reserved.